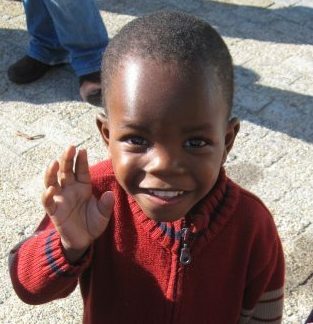 In S. Africa's Orphanages, Is Doing Good Bad? Combining travel and volunteer service is a growing practice in places like Africa and Asia, where foreigners often go to work at orphanages and clinics. But some researchers say that a constant influx of new people may be reinforcing among orphans a sense of abandonment. In S. Africa's Orphanages, Is Doing Good Really Bad? 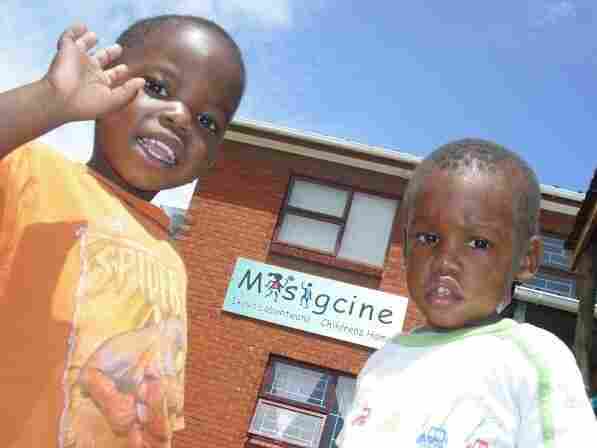 Two orphans at Masigcine Children's Home, near Capetown, South Africa. Some researchers say that foreign volunteers working in children's homes may be harming those they are trying to help. Combining travel and volunteer work, a trend known as "voluntourism" is a rapidly growing industry around the world. One of the most popular activities among international "voluntourists" is working at orphanages and child-care centers in Asia and Africa. But in South Africa, some researchers now claim that foreign visitors aren't actually helping the children they work with. In fact, they might be harming them. The South African government has expressed concern about so-called AIDS orphan tourism, and the Department of Social Development recently said that it will study the issue. 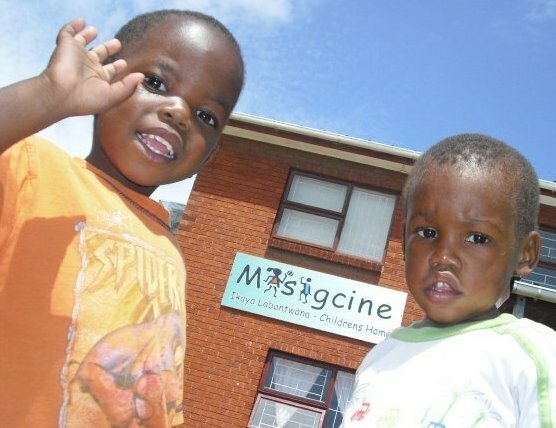 The Masigcine Children's Home houses 28 children who have been orphaned, abused or abandoned by families in the township of Baphumelele, near Capetown. The bookshelves are packed with stuffed animals and books, and the mantle is lined with photographs of the children who live here. Gidsken Asboll, a university student and volunteer from Norway, sits in the living room with a 4-year-old boy cradled in her arms. She tickles him and pretends to steal his nose. The children's home recently began allowing foreigners like Asboll to volunteer here. She spends most of her time holding and playing with the children. "I love to watch them be happy and smile," Asboll says. "We're here to try and give them good memories for the rest of their lives." One of the children who lives at Masigcine Children's Home, which recently started allowing foreigners to volunteer with the kids. There are no current regulations regarding such volunteers in South Africa, but the Department of Social Development recently said that it will study the issue. But some experts now claim that relationships like this can be harmful to children. Amy Norman, a researcher at the Queen Mary University of London, spent five years studying the social effects of HIV and AIDS in South Africa. She is the co-author of a new paper -- "AIDS Orphan Tourism." "The psychological literature talks about attachment theory -- very young children are programmed to build attachments," she says. "And so, you've got these sort of repeated abandonments -- first with young children whose parents may die of AIDS. And then they go to live in an orphanage where you often have high staff turnover." The process continues when well-meaning tourists come to volunteer their time, she says. "And then you've got tourists that are coming as sort of the third wave of this abandonment. Children are left behind to remember a series of these foreigners who come in and then leave them there," Norman says. Asboll says the children bonded with her quickly and expressed a fear that she would leave. "Actually, the first shift we were here, they were like, 'You leave for good now?' " Asboll says. "They were just standing next to the door, and they just -- 'You leave forever?' "
Asboll says she told the kids she would come back. "But that makes me feel nervous because I'm not used to leaving kids that way," she says. Currently, there are no regulations regarding foreign volunteers in South Africa. Volunteers do not have to be trained, and they do not have to be notified of the potentially harmful effects they can have. Because children's homes are generally considered a last resort in child care, South Africa has imposed a moratorium on new facilities. 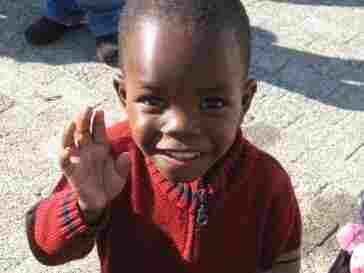 But it is not known how many children's homes exist in South Africa or around the continent, or how many overseas volunteers work in them each year. Noma Mjwara, a social worker at Masigcine, says the staff recognizes the risks of accommodating foreign volunteers. But she says visitors provide a lot of important benefits. "We've had volunteers that come from different types of professions," she says. "Maybe they are educators in their country or they are occupational therapists. Sometimes they just help them with the homework as well." And she says that financial support from overseas visitors is critical to their survival. Masigcine receives $50 per volunteer, per week from the travel company that arranges their stays, and many volunteers also donate directly to the home. At Masigcine, children gather outside the small dining area for lunch. Princess Nomhle and Theodora Tunz, two of the house mothers, lead the children in a short prayer. "When we walk in that door the first time, they just light up and are so excited," American volunteer Krystal Swen, of Kennesaw, Ga., says of the children. "You get that gratification of making a difference." It's what many volunteers say is the best part of their experience. But the question now being asked is: Who is benefiting?